Once you’ve finished building an engine, the bombardment of questions soon follows: What camshaft did you use? How much power do you think it makes? Why is it leaking oil already? Unfortunately, you might not know the answer to one of the most important questions of all: What is your engine’s compression ratio? 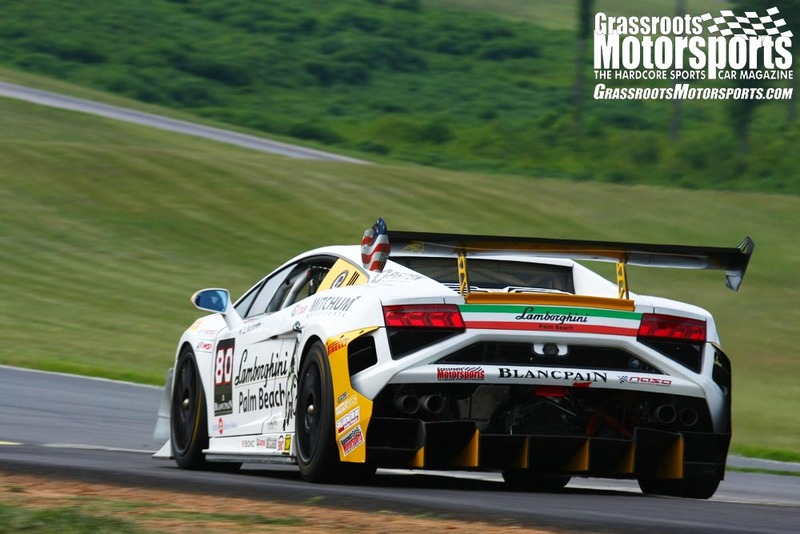 Why is knowing the compression ratio of your engine important? The engine is a system, and being well-versed in the system is vital when it comes to making decisions concerning your car. The compression ratio is an absolutely key ingredient to the system. 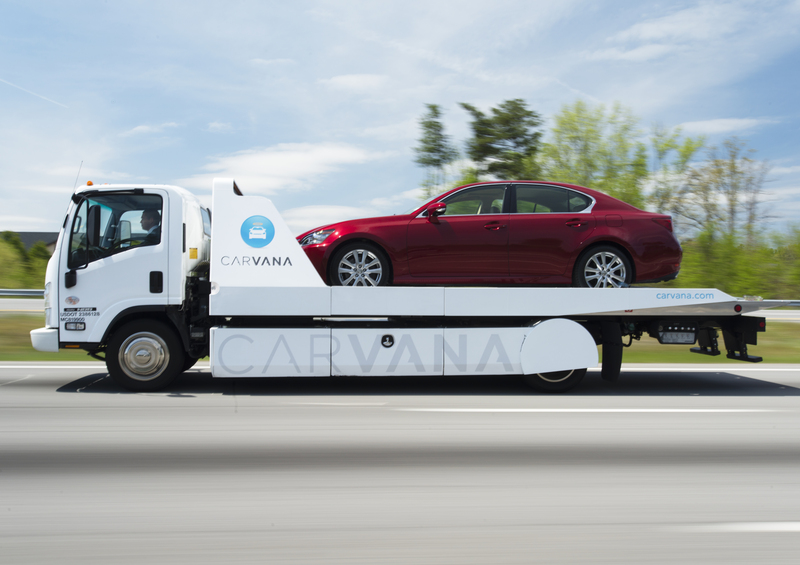 It will tell you what types of performance upgrades you will be able to install down the road—like whether or not it can handle a supercharger or turbo. 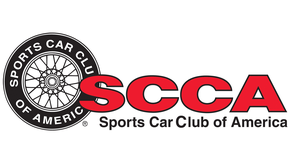 It’s also important to have your compression ratio matched to your camshaft’s ideal ratio; this will let you know what kind of gasoline to run. 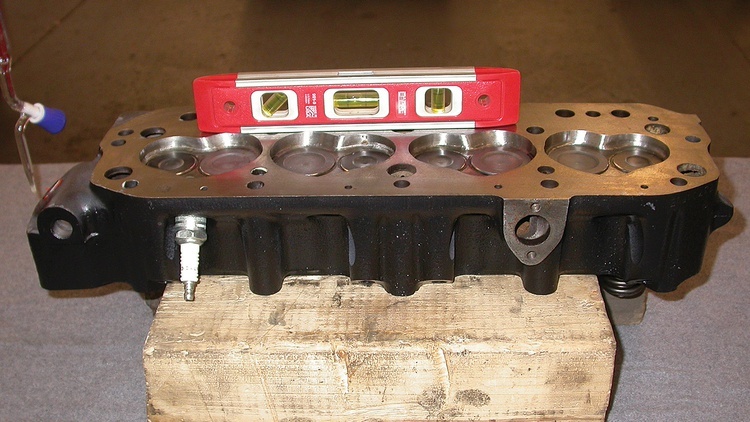 The clearance volume needs to be measured on each engine, since it includes the entire volume of the combustion chamber, including the area inside the cylinder head, head gasket and top of the piston when at top dead center. Compute these figures by filling the respective areas with liquid—water or automatic transmission fluid work well. Accuracy is key, so a kitchen measuring cup is just not enough. While it’s possible to go to a chemistry supply store and make up a kit, several setups geared toward engine builders are already available. Prices range from about $40 to more than $100. We’ve been using the Comp Cams Pro Head CC Kit, and it’s available from Summit Racing for about $110. The kit comes with a 100cc glass burette marked in 0.2cc increments. The kit also includes a plastic plate to seal off the combustion chamber—the plate features a small hole that allows the liquid to get in. To use, simply fill the combustion chamber with liquid from the burette. Here’s how we do it. First, we measure the volume of the head’s combustion chamber. 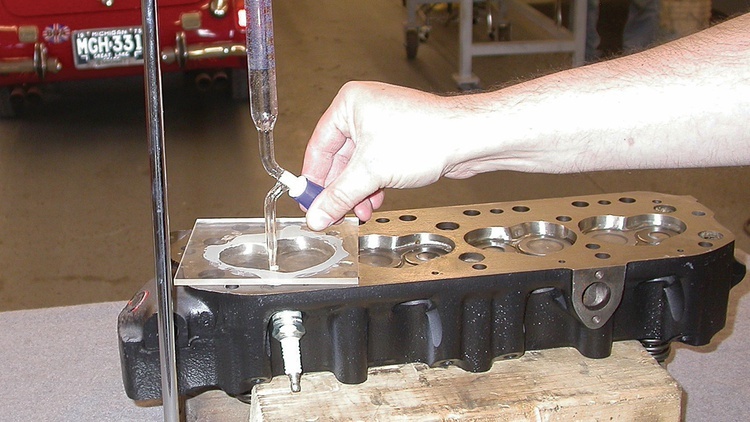 Afterward, we bring a piston to top dead center and follow the same steps to measure the clearance volume. 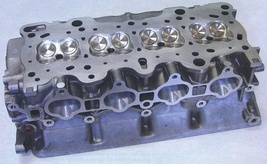 Finally, we find the volume of the compressed head gasket. If a published volume for the head gasket isn’t available, we also use this method. 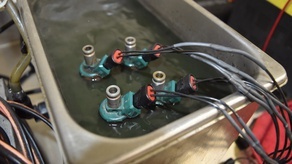 A little grease seals the gasket to a smooth, flat surface that prevents water from seeping out. After that, we can follow the same basic steps. A used head gasket is better for this job, by the way, as it will be compressed after a bit of wear. Okay, time to break out the measuring tools and get to work. We started the compression ratio measurement process by setting the head upside down on our work bench. While we could have made some sort of fancy stand to hold the head, we’ve found that two blocks of wood work just as well. 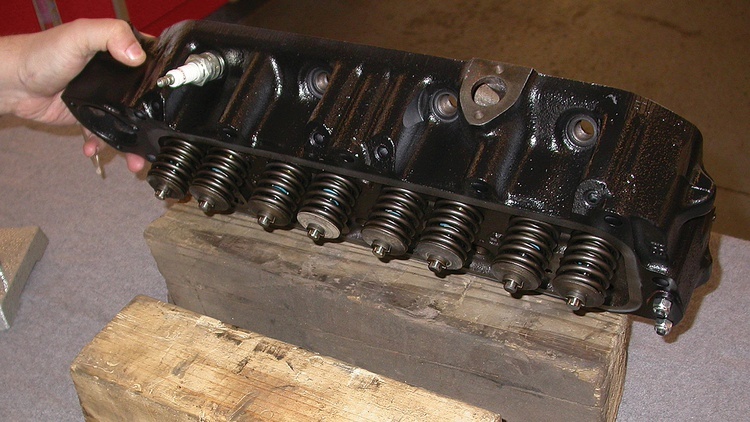 In this case, the valves were fully installed with springs and keepers. If they weren’t, we could have applied a small amount of grease to their edges to seal them in. We also installed a spark plug so that liquid would not leak out of the combustion chamber. Then we made sure the head was fairly level. In order to seal off the combustion chamber and provide an accurate volume reading, we applied a small amount of grease to the outer edge of the combustion chamber, making sure not to get any grease inside. This grease will keep the plastic plate sealed down, preventing liquid from escaping. Before sealing the plate to the head, we needed to figure out where to put the filler hole. Since we’d be using water to displace the air in the chamber, it was best to give the air a natural escape route. Our level told us which edge of the chamber was higher than the others; we placed the hole near the high edge. Time to bring in our 100cc burette—but first we needed to zero it. We filled it with water well past the top mark and then drained it until the water reached the zero line. Because water has significant surface tension, we could see it creep up the sides of the burette. We had to make a decision: Read the top edge or the concave bottom as zero? Either way works, but you have to be consistent. Once zeroed, we set the burette in position above the head. We placed the tip of the burette inside the plastic plate’s hole and began slowly pouring water into the combustion chamber. 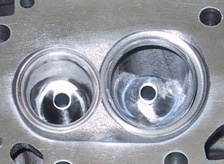 As the chamber filled, we occasionally needed to slightly tap and reposition the cylinder head to shift some small air pockets. Once all of the air bubbles were gone, we shut off the burette. We could now read the burette to determine the volume of our combustion chamber. This process is fairly accurate and easily replicated. We’ll usually repeat it to confirm our numbers. Also, we’ll often check each combustion chamber to make sure the findings are consistent. If your pistons are domed or rise above the deck of the block, you need to do some extra math before computing the engine’s compression ratio. First, calculate how much volume those pop-up pistons displace. 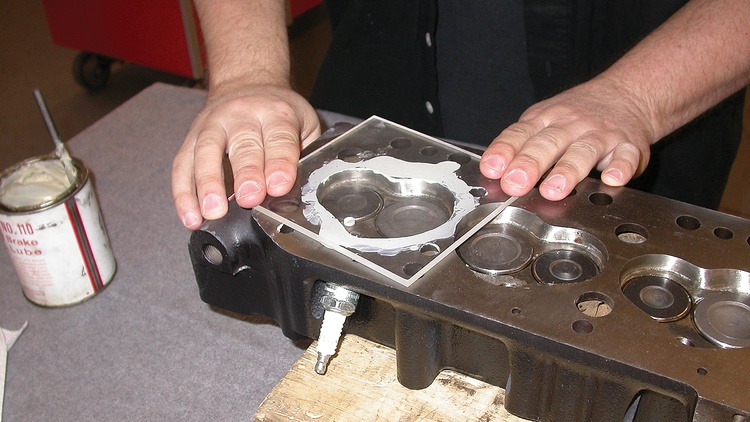 Then, subtract that figure from your combustion chamber and head gasket volume amounts. Height, in this case, is how much the piston rises above deck height. 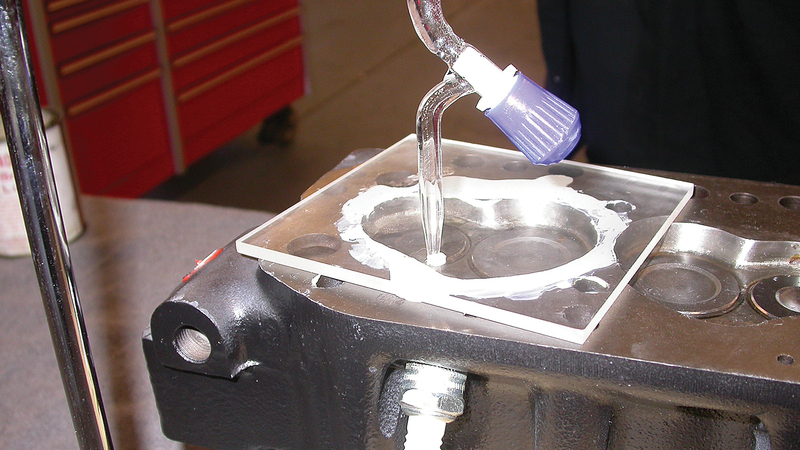 For irregularly shaped pistons that rise up above the deck, you can either consult the piston manufacturer or measure it yourself using the trusty burette. Here’s the trick: Mount the piston in a piston ring compressor so that the highest point of the piston is flush with the top of the compressor. 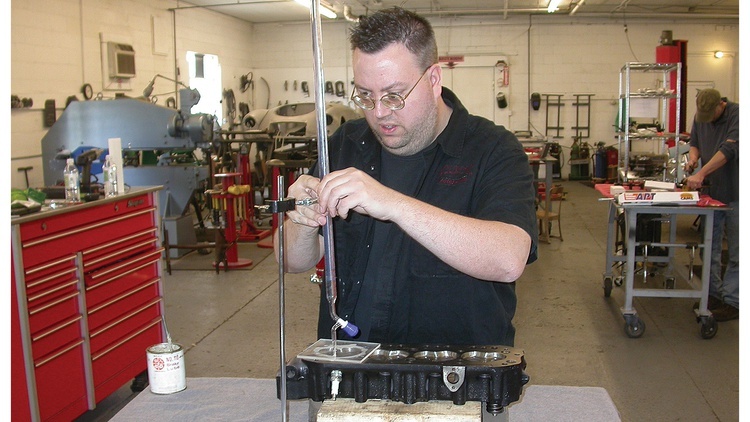 Use a burette to determine how much volume is not filled by the piston. Subtract that value from the above formula. (and in this case, height is measured to the tallest point of the piston above deck height). This final figure is the volume displaced by the piston’s dome. Nice article, now we need one on how to degree a cam for dynamic compression with our new found data. Measuring and adding up various volumes is fine, but I prefer to do it in a more foolproof fashion. Every engine I build goes on an engine stand with the ability to rotate the engine. Rotate the engine so the plug hole is uppermost. Bring the engine to TDC with both valves closed using a dial indicator on the top of the piston, through the plug hole. Use a Burette to run light oil into the plug hole up to the bottom thread of the hole. That is your total combustion space, and needs to be adjusted only to account for spark plug tip (projected tip reduces total chamber volume, but the hollow around the tip increase it - usually close to a wash). This means you don't need to worry about oddball piston crown shape with pop ups etc. You get an exact reading. Just remember to turn th engine upside down afterward to drain the oil out of the chamber. I had a not so fast thinking friend that I showed this method to, roll it upright after doing the compression test, bolted on a starter, forgot one hole was full of oil, and cranked it over on the stand. You might be amazed at how far the stream of oil travels as it comes out of the cylinder through the plug hole the first time that piston hits TDC. The one I saw went 10-20 feet over three adjacent cars. Do I remember something about cranking compression not necessarily being directly related to running compression? Yes there are differences. I think it is due to the heat and expansion of gasses. And you also get better sealing of the rings from the pressures in the cylinder but all that being said I still use this as valve timing has a much greater effect than these things. I don’t know the percentages. That would be interesting to look at. Also, ram filling of the cylinders. And maybe a little bit of "compression takes time to bleed off, and the faster stuff happens, the higher the compression will be". I remember hearing stories of circle track drivers drilling small holes in exhaust valves so that cranking compression was lower than running compression (especially at 8-9k). This method sure sounds easier but how can you be sure that you don't have any air bubbles in the combustion chamber since you can't see into it to check? I can imagine that some combustion chamber shapes might be more problematic than others. That method works perfectly on DOHC engines as the plug hole is right at the top - no air bubbles. It also works on the OHV engines I've done it on, as you rotate the engine on the engine stand to ensure the plug hole is uppermost. It wouldn't work on an enigine already installed in a car, with the plug hole usually on the side of the head. Not saying that there aren't some oddball chamber shapes out there that might not work well, but the majority certainly should pose no problem. BTW, when I calculated the volume using the old addition of all volumes method, the result was always at least 0.5 points of compression off the actual.measured figure. I developed an Excel spreadsheet for calculating DCR with given cam parameters and engine stats. I can see if I can dig it up if you're interested. Screenshot (yes, this was a horrible combo, just for illustration. Further work was done on 9 and 10:1 SCR.